The planet's furthest flung corners are now yours to configure into sound. Recordings and sound design meet with great sounding results. Jammer section brings arpeggiation possibilities to all programs. Building new sounds is comprehensive yet intuitive. You may not know Chris Watson's name but you'll have heard his work. As a field recordist, he's the man who has been trusted to capture natural sound to accompany the images of David Attenborough's Frozen Planet and The Life Of Birds series for the BBC, both of which won BAFTAs for Best Factual Sound. His recordings have taken him around the world and filled hard drives full of extraordinary sounds. Sonic Couture's programmers have persuaded him to hand some of these over to a collection of the world's leading sound designers - Ian Boddy, Biomechanoid, Martin Walker and Andy Wheddon - to build a Kontakt-hosted library. The result is Geosonics and, to give the game away at the very start, it's a media composer's dream. The library is organised into four folders, whose names echo the environments in which Chris' sounds were captured: Wires, Ice and Water, Swamps, and Wind. The sound designers have constructed 400 presets based on these raw recordings which, in turn, are built around three layers. 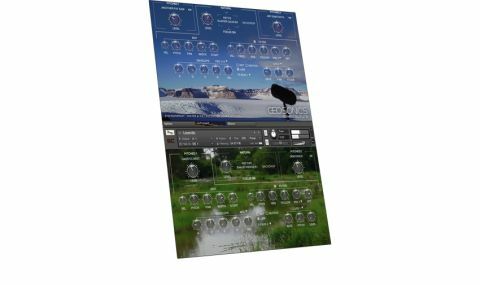 "The Original Recording Presets folder allows you to trigger Chris Watson's Natural recordings in slices across the keyboard range"
To understand Geosonics' capabilities fully, it helps to build a new sound from scratch. Ignoring the preset patches, the best place to start is in the fifth folder of Original Recording Presets. These allow you to trigger Chris Watson's Natural recordings in slices across the keyboard range, so the pain of isolating the section you like from a few minutes' worth of recordings is made easier. Once you find an appealing slice, click the Focus button, which maps the most recently triggered note across the whole keyboard range, to form the bedrock of a program. On either side of this, you can then load Pitched waveforms to provide a supporting role, the material in each of these taken from a combination of 'processed' recordings from Chris' original sample material and some additional sampled waveforms. These include 'regulars' such as saw waves, to provide more familiar, pitched musical foundations. Each of the three sections - Natural, Pitched 1 and Pitched 2 - has its own Level control and then, en masse, they feed into a collection of synthesis parameters, allowing you to set global controls for Pan and Stereo Width, before filter, envelope and LFO sections. All of this functionality is available within the main Instrument tab, but in Options you can enable some key additional features. You can set the Mod Wheel to provide real-time control over Natural and Pitched element levels and you can also enable Jammer, which brings Arpeggiator-like functionality to any program. Rate, Timing, Velocity and Mod controls combine to get the sounds dancing, chiming and evolving in time. There are also three effects engines on board - two FX busses and the wonderful Space generator, which brings convolution reverb IRs to bear on your sonic constructions. Geosonics will appeal most to sound designers and media composers, who will fall in love with its density of textures and rich sonic starting points in equal measure. However, there is plenty for EDM heads too - rich pads feeding comprehensive effects and clouds of sonic possibility to configure into production layers. If you're searching for a more leftfield sonic starting point from which to launch your tracks, Geosonics might be just what you need.